She ranks as one of the greatest civil rights icons of all time, all starting with a seemingly simple act of refusing to move from a bus seat. 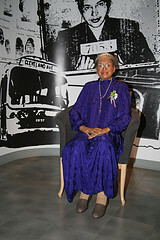 Rosa Parks passed away at age 92 in 2005, living in a modest apartment in Detroit, Michigan. Rosa Parks estate was modest too. Officially valued at $372, 624 in monetary terms, but of course priceless in terms of memories and historical significance. Her final wishes were not so modest. She assigned all of her belongings to a charitable institute to “educate and motivate youth and adults, particularly African American persons, for self and community betterment.” She called this the Rosa and Raymond Parks Institute for Self-Development. She named her close friend, Elaine Steele, along with a retired Detroit judge, to oversee her estate. She also named Elaine Steele as a prominent beneficiary, including a 90% recipient of royalties, with 10% passing to her nieces and nephews. But Parks’ many nieces and nephews did not agree with her final will and trust, which were created in July, 1998. They sued to challenge the estate plan, accusing Steele of using undue influence on Parks. Steele denied it. After the case was started, amid claims of mismanagement, the probate judge removed Steele and the other appointed executor and replaced them with two local attorneys. On the eve of Rosa Parks estate trial, the parties settled with a confidential settlement agreement that upheld the will and trust as valid, re-instituted Steele and the retired Judge as the executors, and gave the nieces and nephews additional rights and royalties related to Parks. This left Steele in control of Rosa Parks’ Institute. That didn’t end the fighting though — far from it in fact. The parties continued to battle in court over the amount of fees charged by the two attorneys who still, despite the settlement, were allowed to remain in charge of the estate and trust. The fee dispute went to the Michigan Court of Appeals. It was at that stage that an attorney representing Steele and the Institute was accused of violating the confidential settlement agreement by revealing certain information in open court in front of a newspaper reporter. The probate judge was so incensed at this that he ordered that Steele and the Institute both forfeit all rights to Rosa Parks’ property and royalties. This meant that Rosa Parks’ express wishes as set forth in her 1998 Trust were completely changed by the judge … all because he felt an attorney disclosed something about the confidential settlement agreement in a court proceeding. The Court ordered that Steele and the retired Judge were to be restored to their positions in charge of the estate and trust, and all of Parks’ wishes as expressed in her trust were to be, once again, followed, in accordance with the settlement agreement. The Supreme Court’s ruling was only a page and a half long. The seven judges found the probate judge’s prior ruling to be “clearly erroneous.” They slapped the hand of the probate judge and mandated that Steele and the other executor be put back in place within 30 days, or the judge would have to explain to the Supreme Court why that could not be done. Before this recent Supreme Court ruling, Rosa Parks’ belongings were scheduled to go to auction. Now the Institute she created will be in control of them, as Parks wished (according to her trust) all along. It’s a sad reality that the final wishes of someone who died are not always followed, and instead, often lead to expensive court fights. The best prevention is good estate planning, done early, before there is a question of someone’s mental competence or whether they are being unduly influenced. Too many people think that only “old” people have to do their estate planning, so they wait. Rosa Parks was in her mid-80′s when she created her trust. Her nieces and nephews feel strongly that the trust was not what she really wanted. Because of this, they filed a challenge that ultimately caused Rosa Parks’ wishes to be undermined for years. It’s a good lesson for professionals and family members alike to share with their clients and loved ones. Encourage others to take care of their estate planning, with an experienced estate planning attorney, early, and not wait until they are “old”.